MANILA -- Department of Foreign Affairs (DFA) Secretary Alan Peter Cayetano on Wednesday dismissed as mere "anti-Duterte propaganda" a documentary by the British Broadcasting Corporation that described the outlook of democracy in the Philippines as "bleak". 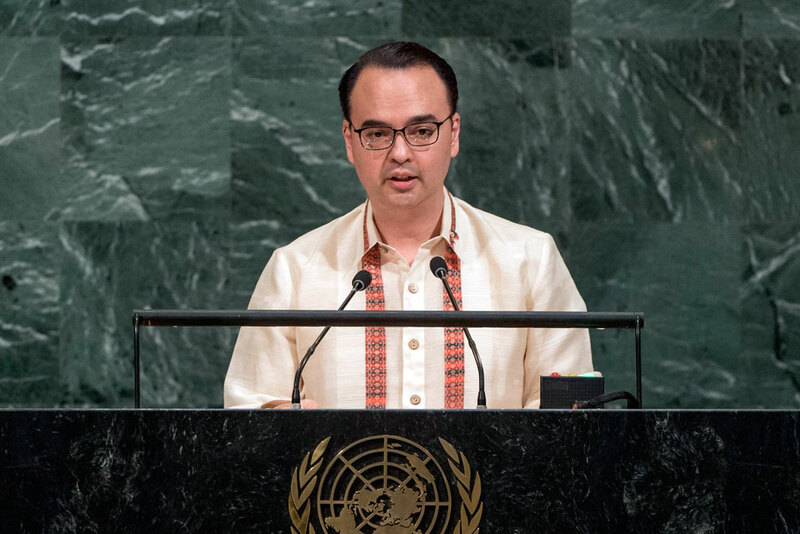 In a statement, Foreign Affairs Secretary Alan Peter Cayetano expressed his dismay on BBC's September 29 feature "Our World—Philippines: Democracy in Danger?" which focused on President Rodrigo R. Duterte's anti-drug campaign and alleged political persecution in the country. Cayetano brands the episode as misleading, pointing out that Duterte’s anti-illegal drug strategy "is actually making Philippine society safer, healthier, and more prosperous." "It fails to mention that the strategy is a diversified and community-based approach that includes enforcement, rehabilitation, and reintegration," he said. "The episode also makes little mention of the sheer magnitude of the drug problem in the Philippines, the enormous damage to millions of families caused by addiction, and the fact that police are under strict orders to follow the law in the conduct of our campaign against illegal drugs," he added. As of August 31, 2018, at least 576 government workers, including elected officials and uniformed personnel were arrested while another 498 are being investigated for drug-related cases, Cayetano said. He added that 105 uniformed personnel were dismissed for drug-related offenses. Moreover, a total of 235 drug dens and clandestine laboratories were dismantled; PHP24.12 billion worth of illegal drugs and drug-related items were seized; and at least 8,444 barangays or villages were cleared of illegal drugs from the campaign's beginning on July 1, 2016 to August 31, 2018, he added. He said the report also painted "a one-sided picture" of Senator Leila de Lima, Senator Antonio Trillanes IV, and former Chief Justice Maria Lourdes Sereno. Cayetano underscored that the three staunch critics of the administration have been "given and continue to be given" their day in court. "The rule of law has been upheld in all three cases. They are not, as the report unfairly alleges, victims of any crackdown on the political opposition. The report also failed to mention the obvious: all three remain free to criticize the Duterte Administration," he said. He also denied that the media in the Philippines is being persecuted. "Those who read our newspapers, watch our television programs, listen to our radio broadcasts, take part in dialogue through social media, and read online publications can observe that the press is anything but inhibited in the Philippines,” he said. Cayetano emphasized that Duterte continues to enjoy the trust and support of the Filipino people. "We are taking control of our economic future, making our society safer and healthier, and advancing the interests of Filipinos abroad,” he added. "Filipinos know this and this is why seven out of 10 Filipinos trust President Duterte and three out of four approve his performance," he added, citing a Pulse Asia poll released on September 25.